In setting up new cycling trips in Zagori, north-west Greece, at the forefront of our minds has been our guests’ desire to be safe, well looked after and to return home with a genuine understanding of the culture that underpins the place. And one of the reasons we’re so excited about welcoming guests to Zagori this year is because we think we have done that. Our local team are awesome. And a key member of the local team we’ve put together is classicist Josh Barley. He’s a Brit who has lived in Athens for much of the past decade, working as a writer and translator for some of Greece’s best modern poets. 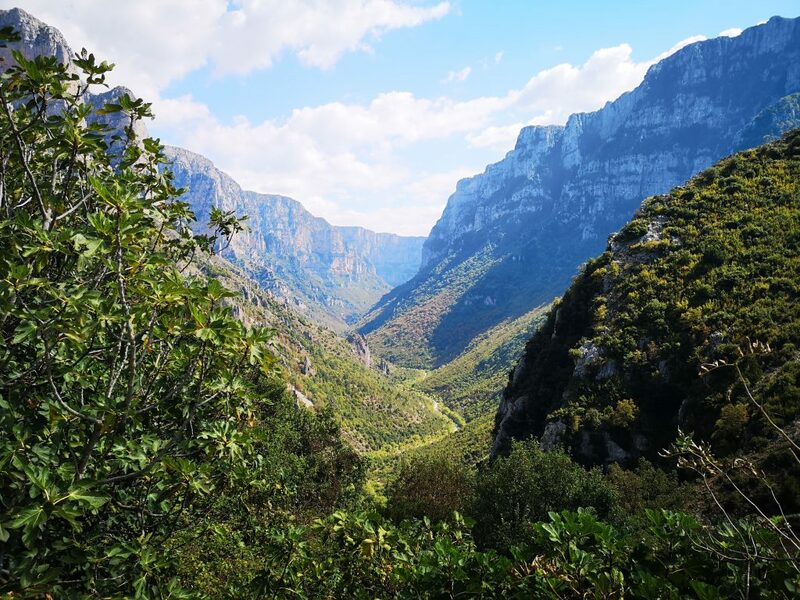 Epirus, and particularly Zagori, is Josh’s favourite part of the country and so we’re delighted he’s agreed to guide our trips – alongside local Lefteris – this coming year. I sat down with him earlier this month and posed a few questions. How did you arrive at being a guide? I became a guide in Zagori because I love the place. I am not from the area (as I’m sure is obvious) but I have been visiting and occasionally living in it for the best part of a decade, while based in Athens. I find it an inexhaustibly interesting place. I do not guide anywhere else. How has the area changed since you first visited? Very little. That’s its beauty. A few more people have arrived than have left, I think. What’s your earliest cycling memory? I fell off my bike when I was thirteen, taking evasive action from an oncoming bus on Silver Street Bridge in Cambridge. The second part of the story was having the cast of my broken arm taken off in a hospital in Mombasa, Kenya. That’s not my first cycling memory, of course, but I suppose it’s the most painful. Do you have a favourite place in Zagori? There is nothing like the limestone of the Vikos Gorge changing colour at sunset. By some strange measure it’s the deepest gorge in the world, and it is quite magnificent. Do you have a piece of kit you would never be without? What’s your favourite traditional Greek dish? Do you cook it at home? Youvetsi – lamb cooked with little ‘orzo’ pasta. I do cook it at home, but it’s not quite the same as when it’s cooked in the oven of the village bakery. What is your favourite local legend? That the sailors of Napoleon’s fleet at Trafalgar were cloaked in capes made from the wool of sheep from the mountains of Zagori. Is there a traditional local game you and your friends enjoy playing? Making spirits from various unlikely fruits. Who’s your favourite local writer? Do you like one of their books in particular? The poet Michalis Ganas, from Epirus. His collection ‘Glimmering Yannena’ quite literally changed my life. An article I wrote about him is here. Do you have a favourite word in Greek? And when you’re not guiding, how do you spend your time? Do you have a secret talent? Translating and writing. I’m sure I’ve done my best to exhibit any talent I may have, with the result that unfortunately nothing has remained secret. Somewhere in the middle of the Pacific, like Tahiti.